Step off the beaten path and head to Carlos Rosario Beach and Museo Historico de Culebra. 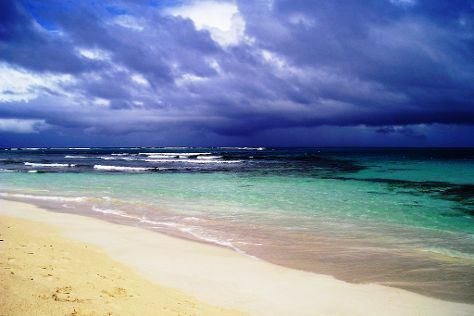 Visit Flamenco Beach and Playa Punta Soldado Beach for some beach relaxation. There's still lots to do: stroll through Zoni Beach, step off the mainland to explore Culebrita Island, visit a coastal fixture at Culebrita Lighthouse, and get lost in a book at Culebra Public Library. To find maps, ratings, photos, and more tourist information, go to the Culebra driving holiday planner . New York City, USA to Culebra is an approximately 6.5-hour flight. You can also do a combination of bus and flight; or do a combination of flight, shuttle, and ferry. Due to the time zone difference, you'll lose 1 hour traveling from New York City to Culebra. Traveling from New York City in September, things will get a bit warmer in Culebra: highs are around 89°F and lows about 79°F. Wrap up your sightseeing on the 11th (Wed) to allow time to travel to Isla de Vieques. Relax by the water at Media Luna Beach and La Plata Beach. Museum-lovers will appreciate Fortin Conde de Mirasol Museum and Siddhia Hutchinson Fine Art Gallery. There's lots more to do: contemplate the waterfront views at Sun Bay, take in the waterfront at Mosquito Pier, enjoy the sea views from Puerto Ferro Lighthouse, and get a new perspective on things with Boat Tours & Water Sports. For more things to do, other places to visit, reviews, and tourist information, read our Isla de Vieques trip itinerary tool . Do a combination of flight and car from Culebra to Isla de Vieques in 2.5 hours. Alternatively, you can ride a ferry. In September in Isla de Vieques, expect temperatures between 88°F during the day and 77°F at night. Finish your sightseeing early on the 15th (Sun) so you can travel to El Yunque National Forest. On the 16th (Mon), look for all kinds of wild species at El Yunque Rain Forest. On the 17th (Tue), you'll have a packed day of sightseeing: whizz through the canopy at some of the top local zipline courses and adventure parks, tour the pleasant surroundings at Monserrate Beach, and then stroll through Balneario Luquillo. For more things to do, other places to visit, reviews, and tourist information, use the El Yunque National Forest route builder . Traveling by combination of flight and shuttle from Isla de Vieques to El Yunque National Forest takes 2 hours. Alternatively, you can do a combination of ferry and car; or do a combination of ferry and shuttle. Expect a daytime high around 90°F in September, and nighttime lows around 78°F. Finish your sightseeing early on the 17th (Tue) so you can drive to Ponce. Ponce is both a city and a municipality in the southern part of Puerto Rico. Kick off your visit on the 18th (Wed): get engrossed in the history at Ponce History Museum, then stop by Plaza del Caribe, and then step off the mainland to explore Isla de Caja de Muertos. On the next day, admire the masterpieces at Museo de Arte de Ponce, see the interesting displays at El Museo Castillo Serralles, then see the interesting displays at Parque de Bombas, and finally admire the striking features of Cathedral of our Lady of Guadaloupe. To find traveler tips, more things to do, maps, and tourist information, read our Ponce trip itinerary app . Getting from El Yunque National Forest to Ponce by car takes about 2 hours. Other options: take a shuttle; or do a combination of flight and car. Traveling from El Yunque National Forest in September, expect nights in Ponce to be about the same, around 76°F, while days are slightly colder, around 85°F. Finish up your sightseeing early on the 19th (Thu) so you can go by car to Rincon. Museum-lovers will get to explore Playa Oeste Gallery and El Faro Lighthouse. Visiting Scuba & Snorkeling and Domes Beach will get you outdoors. Change things up with these side-trips from Rincon: Cabo Rojo (Buye Beach & Los Morrillos Light). There's lots more to do: look for all kinds of wild species at Tres Palmas Marine Reserve, look for gifts at Ocean State of Mind, and tour the pleasant surroundings at Sandy Beach. Plan trip to Rincon with our itinerary maker to find out where to go and what to do. Traveling by car from Ponce to Rincon takes 1.5 hours. Alternatively, you can do a combination of shuttle and flight. September in Rincon sees daily highs of 90°F and lows of 80°F at night. Finish up your sightseeing early on the 22nd (Sun) so you can travel back home.